The feeling I feel most desperately, most often, is the wish to slow time down. But not time like I'm experiencing it now...to be alive enough to feel a moment. Ninety percent of the time I'm whizzing past it only to look back fondly later - wondering what it might've felt like, if I'd been in it. But I used to whiz past ninety-five percent of the time, so I'm hopeful. My five percent breakthrough happened during my first No Spend month. That was my first taste of being present. Before that it was a fantasy and I had no idea how to it make real. I was always "in" the next thing. If I was taking gorgeous photos of my babies, I was excited because they'd be so beautiful in a scrap book one day. I put happiness in the illusive tomorrow and strung myself along on the anticipation of it. It wasn't until shopping was off the table for a month, that I started to see my family in a God-I-couldn't-be-happier-in-this-moment way. What on earth am I feeling right now? Ohh...contentment. Perfectionists aren't allowed to feel that way. We've never found "good enough" and if we have, we labeled it "could be better," while outlining an action plan for improvements. Our joy is safely awaiting us at the end of that list, but when we get there, we see a note that reads, "But your sock drawer's a mess." We forget to enjoy anything, scrambling to our sock drawer's aid. I however, am a recovering perfectionist and I'm learning to celebrate at the end of projects and even mid-project. It's just harder for me. But I'm determined, and here's why. (This lady wrote a list of a thousand things she saw God in, so that's what she means when she says "the next glimpse of glory.") I want to live. And when I say that, when humanity says that, we're really saying we want to live in a satisfying, full, happy way. I remember how disillusioned I felt when I earned my college degree and felt none of the satisfaction I'd imagined. It felt empty. I loved school. I loved what I learned to do, but the joy I'd imagined at the end of the rainbow? It wasn't there. I guess I don't want to be at the end of a rainbow. I want to be smack dab in the middle of God, and I am, but I stink at seeing it. So many of the things I have to be thankful for have drawbacks. Like my body wash that smells so good? It has mineral oil in it, which I just learned is like plastic wrap on your skin, keeping your skin from detoxing properly. The way freshly grated cheddar feels between my fingers? Not the best food my family could eat. See? I'm grumpyville's queen - the ultimate critic. And the other thing Ann says in her book is that discontent is really saying no to God. Instead of opening your heart to him and saying, yes, to whatever he gives, we spurn his choices and say they're not good enough, some of us with more "reason" than others. After all there are bigger problems than mineral oil in your soap. So here's my new goal to add to my strategy for simple or minimalist time management. Spend less energy analyzing and more mental time being open and thankful. Spend less time obsessing about how I'd prefer things and take them as they are with all their (gasp - who do I really think I am?) "faulty" reasons for happiness. In the precious time I've been given, I want to let myself live like a child, not questioning so much and trusting the gifts any way they come. If you don't believe a perfectionist can do this, take a look at these photos. 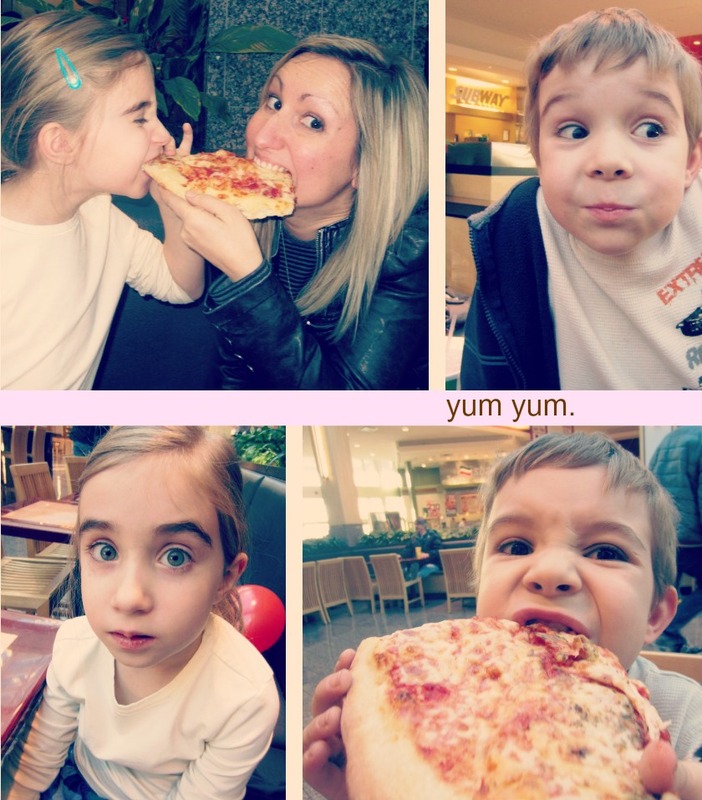 This is me, with my family, enjoying deep fried food and pizza at the mall. I'm choosing, even now, not to over-think it because we were having a good time. When I was there, I had to breathe and tell myself it was okay a couple times, but it was great - a moment I won't wonder how it would've felt if I'd been there, because I was. P.S. Here's the book I referenced, and just so you know, I get a small commission if you buy it through the link.